Print one copy, the dimensions will been approximately 3" x 3". Glue the wallpapered area to mat board, score and fold the mat so the room has three walls. Glue two pieces of mat together then glue on the fireplace and cut out. Glue one fireplace, not on mat under the painting. Glue the mat fireplace with the dark area cut out on top. Add a narrow piece of mat for a mantel, color with felt pens or paint. Cut another very thin long strip of card stock to frame your painting. Glue the doors onto card stock then glue one onto a wall. Cut the wreath and garland out of the other and cover with tiny green foliage or sponge, glue onto door on wall. Cut a thin strip of card stock to put molding around the door . 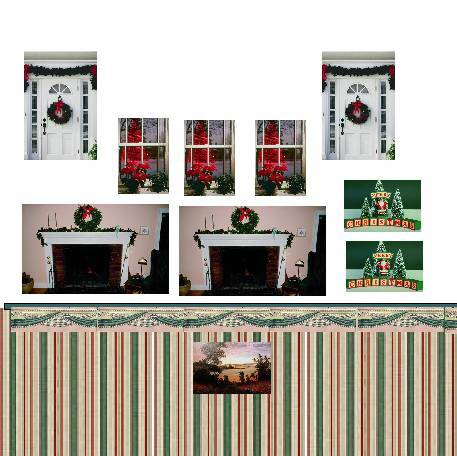 Glue a window image to a wall add card stock molding and trim. Use the other window images to cut out leaves of poinsettia, shaping and layering them. Glue the blocks onto card and cut them out and glue on the mantel. Hope you enjoy this project. The printable carpet used in the photo to for my carpet and couch are on the Printable carpet page. For your personal use only please.